Get free standard shipping when you spend $150 or more at J.Crew now through May 31, 2010, at 11:59 p.m. EST. Use coupon code RBY7D9 when checking out. You have to enter your credit card info, along with the promo code on one of the last checkout pages . J.Crew's famous polos are on sale and make a nice gift for Father's Day, which is right after Memorial Day this Monday. 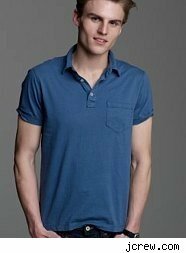 The polos are $20-$35 (orig. $40-$43). The women's sale has a mix of tops, dresses, swim suits, and more. Check out these shiny silver slingback heels, which are unfortunately $130 (orig $225). Caveats: previous purchases are not eligible for this discount. The $150 total does not include shipping, handling and taxes. Not valid on telephone orders. Cannot be combined with any other promotion.